The income of the average American household is expected to continue to plummet in 2009 as the country continues to slog through the stinging effects of the "Great Recession". While median household income and mean household income numbers haven't been released for 2009 as of yet, you can safely assume that the final figures will end up looking pretty ugly. 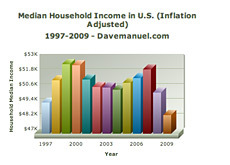 In 2008, the median household income in the United States was $50,303. Median household income is defined as "the amount which divides the income distribution into two equal groups, half having income above that amount, and half having income below that amount." Median household income in the United States has been in a freefall over the past few years due to the "Great Recession". In inflation adjusted dollars, the last time that the median household income in the United States was $50,303 or lower was 1997. This is a staggering drop that has completely erased all of the gains made in the beginning and middle stages of the decade. 2009 should be even worse, as many are expecting that median household income in the United States could drop as much as 5%. This would leave us with a median household income number of about $47,800. This would be the lowest such number, in inflation adjusted dollars, since 1995. The mean household income numbers have been obviously falling off a cliff as well. Mean household income is described as "the amount obtained by dividing the total aggregate income of a group by the number of units in that group." 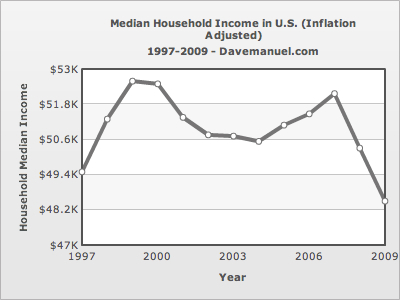 Mean household income in the United States in 2008 was $68,424, down from a peak of $71,436 in 2000 (inflation adjusted). Assuming a drop of 5% for 2009, mean household income would drop to just over $65,000. 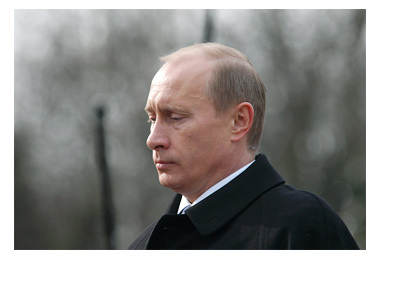 This would be the lowest such figure since 1996 ($64,392). The reason for the drop in household income is obvious - the two-year recession in the United States has had a ruinous effect on the employment prospects of the country's citizens. With a national unemployment rate of 10%, many households are having to deal with the loss of either a substantial portion or all of their income. This has resulted in household income swirling down the drain, with no relief in sight. The final numbers for 2009 won't be finalized for a while, but one thing is for certain - they will be ugly.